Compile a "library" of existing articles, papers and books on the process of conducting joint evaluations in the development context and lessons learned. 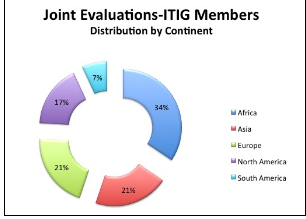 Document the incidence and type of joint evaluations in the countries where participating IDEAS members reside or work. Encourage members to write on, and share, their successes, difficulties and lessons learned with joint evaluations, including the steps that had been undertaken to identify and overcome problems, thus building a growing body of knowledge. Analyse and document the factors and strategies that contributed to the success, weakness or failure of completed joint evaluations. Develop a dynamic toolkit, including checklists and templates, for effective design and execution of joint evaluations, by options for joint country evaluations, joint project evaluations, single partner versus multiple partners.